Ride4Life will be running their charity rides again this year. From humble beginnings in Bendigo in 2017 we now have a Melbourne ride as well. We run these on the same day as the Bendigo Suicide Prevention Awareness Network walk. This has the effect of combining riders and walkers raising awareness of mental health issues and suicide prevention. Bendigo SPAN has now shifted their walk from the 3rd Sunday in March to the 5th May which is the reason for the change in the timing of the walk. We also hope it will be a little cooler and more pleasant riding weather after some very warm days over the last few years. This is a very important question. There are so many charities around these days that simply do not disclose where their event money actually goes. With Ride4Life Charity Ride Events it is very simple. We charge you a registration fee as a rider and as a pillion. From this amount there are deductions for PayPal fees and a ride patch as a memento for the ride. The rest of the registration fee in its totality goes to the nominated charity that the ride is supporting. All money raised from the rides will be going to Lifeline to continue their magnificent work. We are currently working on some projects with Lifeline so that we are funding front line services. 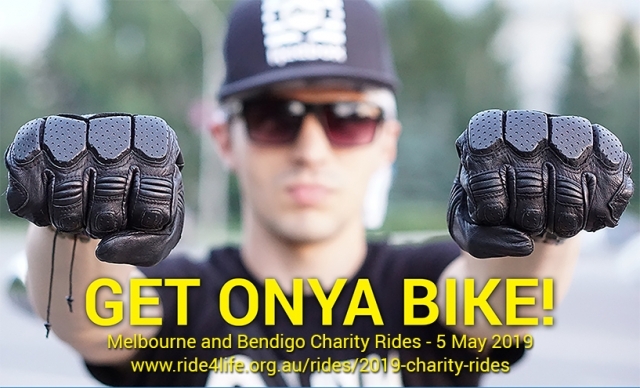 Funds go initially through the Ride4Life donations pages as we are a registered charity and have Deductible Gift Recipient status with the Australian Tax Office. You need to be aware that although your ride registration fees go to Lifeline, these are not considered a donation by the ATO as you are receiving something in return, (the ride), for this money. However any monies you donate over and above this amount to Ride4Life itself or to us to go to Lifeline should be tax deductible. Please check with your accountant. No, you don't, but there are some good reasons why you should. Most importantly, your online registration allows us to tell coffee vendors and end destination lunch suppliers our numbers. We would hate to see people missing out on lunch. We are offering a discount for early bird registration. Even though 100% of your nett registration fee goes to our Lifeline project as detailed above, it will cost you more on the day. If you want to donate more to the Lifeline project, you can do it when you register anyway. We do not contribute direct to Lifeline itself or the branches as this money could be used for administration. As a group, we are not interested in raising funds for other people's administration. Lifeline provide the Ride4Life committee with a list of projects they are working on at the time. The Committee selects a particular project to direct all funds so that they are not just going to Lifeline's administration. We are totally committed to funding front line services. Select the ride that suits you to attend and Register for the ride. All rides are run by experienced riders and they are not intended to be a race. We ride in staggered formation wherever possible to keep the group together. This also means no-one passes the lead rider and remains in the group. Safety of all riders is considered paramount. Obviously you can ride with us. Links to the registration pages are below. One thing we would appreciate is if you can share the events on your Facebook, Twitter or other social media to get the word out there and help us raise money for our projects. You can now set up your own donation page on GiveNow to encourage your friends and family to support you doing the ride and Lifeline at the same time. Go to https://www.givenow.com.au/lifeline2019 to set up your own personal page. Simply click on "Create Crowdraiser" and follow the prompts.